Here are two fun, NO PREP, Valentine’s Day sensory motor freebies! They are from the Valentine’s Day Sensory Motor Packet. These two activities are ready to go! Just print and start practicing fine and gross motor skills. 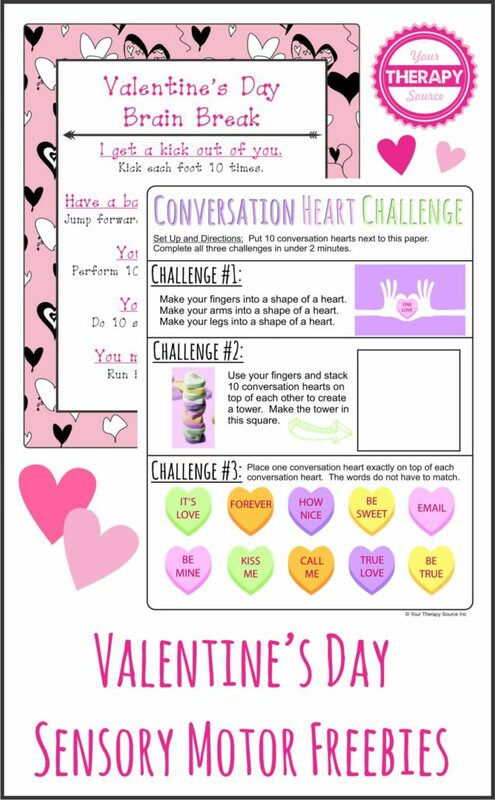 The Valentine’s Day Brain Breaks is a great group activity to get heart rates up. The Conversation Heart Challenge encourages fine motor skills and graded control to see if you can complete the challenges in under 2 minutes. DOWNLOAD THE Valentine’s Day Sensory Motor freebies. Preview the Valentine’s Day Sensory Motor Packet below. 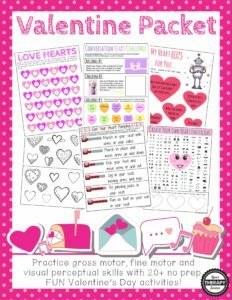 Valentine’s Day Sensory Motor Packet – Practice fine motor, gross motor, visual perceptual activities with this NO PREP, fun, Valentine themed packet. This is an excellent activity packet for in class activities, therapy sessions, Valentine’s Day parties, carry over activities, brain breaks, early finishers and indoor recess. FIND OUT MORE.